Water transfers are transactions between sellers who may have an excess of supply and are willing to sell some of it temporarily, and buyers who need additional water supplies to meet their demands. 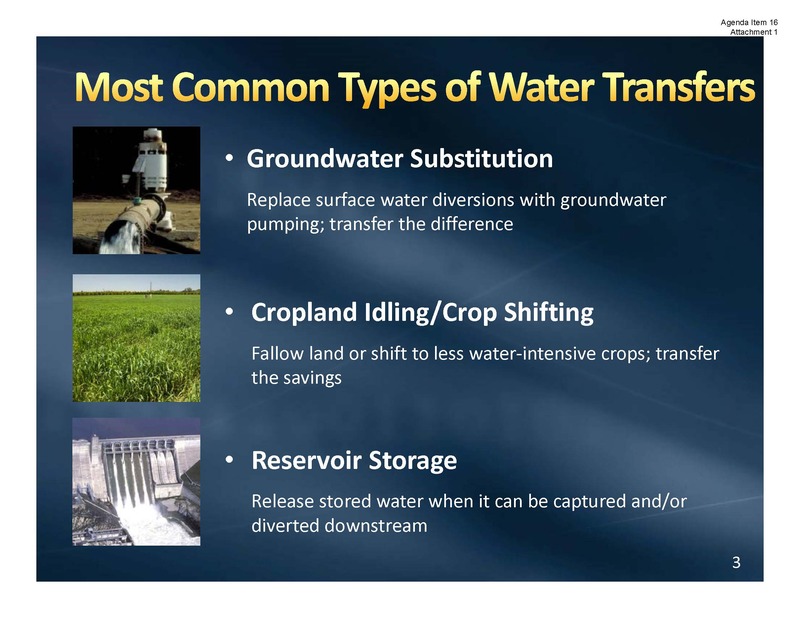 Water transfers can be an effective tool for water managers to move water to where it is needed most, especially during times of drought. But water transfers are not easy transactions, nor are they without controversy. The impacts of transfers can be many, and can affect not only the area from which the water is transferred, but downstream users and instream flows as well. Impacts can be both economic and environmental, so to ensure that these impacts are identified and minimized, transfers involving public agencies are required to comply with CEQA or NEPA. 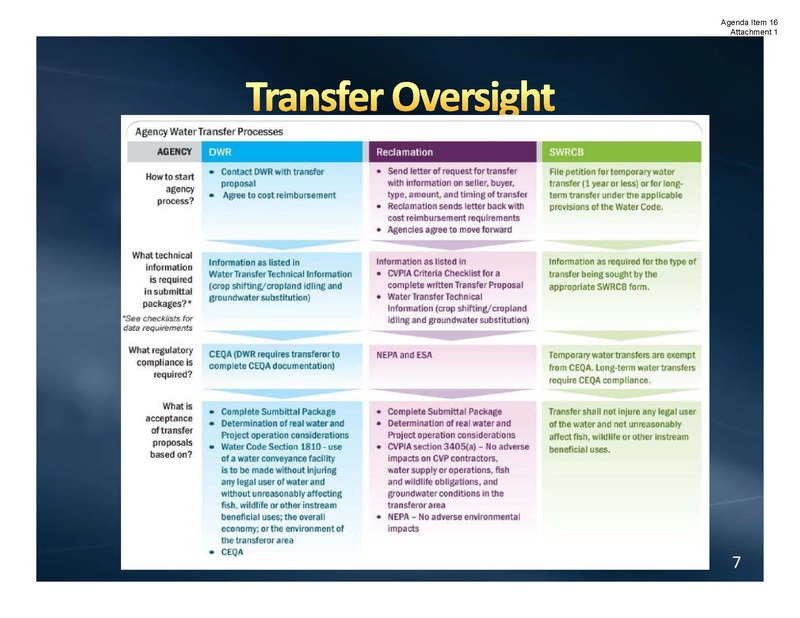 In addition, most transfers are reviewed by the State Water Resources Control Board, the Bureau of Reclamation, the Department of Water Resources, or a combination thereof. Single-year transfers (transfer agreements lasting up to one year) are short-term commitments that help farmers and water managers react to seasonal circumstances. In approving the Delta Plan, the Delta Stewardship Council considered single-year transfers which utilize the Delta and their impact on the coequal goals; the determination was made to exclude them from the Council’s covered action process until December 31, 2016. 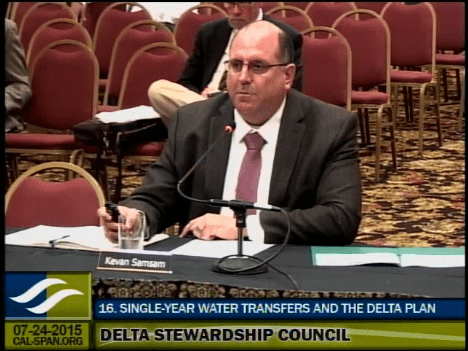 With the exemption set to expire, the Delta Stewardship Council is examining the issue of transfers that utilize the Delta, focusing on single-year transfers and their possible impact on the Delta. 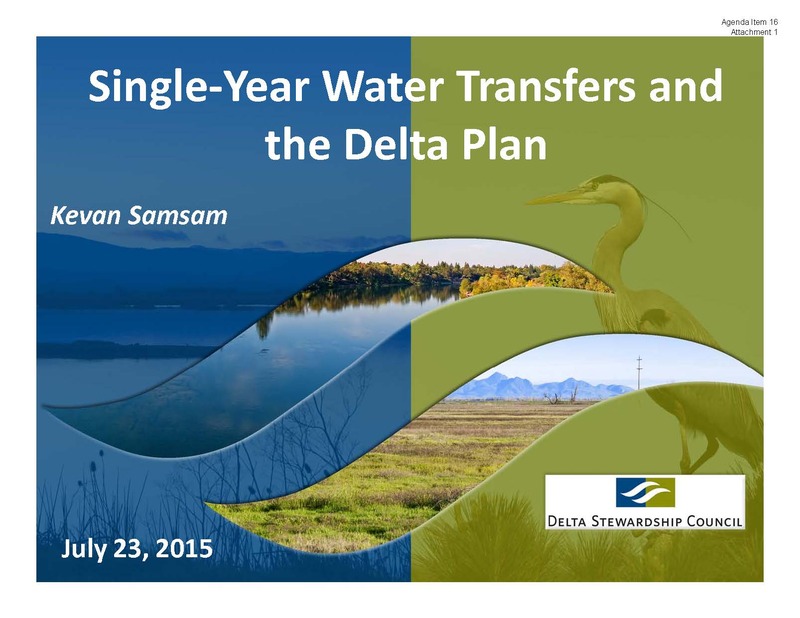 So this week, we’ll be following the Delta Stewardship Council as they examine water transfers in detail. Today’s post gives the background and basics of water transfers, which sets up for the much more detailed discussions that will follow. 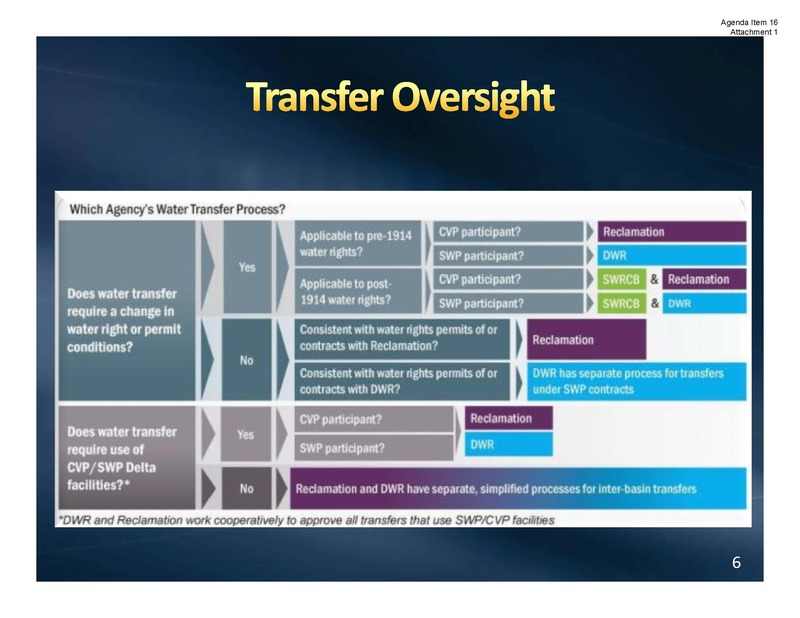 Tomorrow, we’ll hear from Bill Croyle with the Department of Water Resources and Tom Howard with the State Water Resources Control Board on the transfer process. On Wednesday, Dr. Bruce Herbold and Sandi Matsumoto with the Nature Conservancy discuss environmental impacts of transfers. 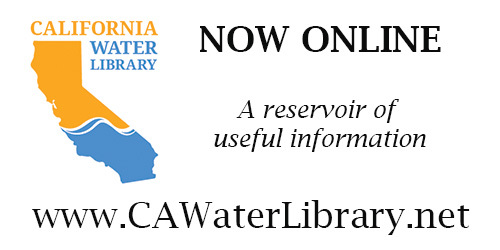 The series will wrap up on Thursday with a panel comprised of water lawyer Dustin Cooper representing buyers, and Frances Mizuno with the San Luis & Delta Mendota Water Authority and Steve Hirsch with Metropolitan Water District representing sellers. In preparation for the upcoming discussions, Council staff reviewed the basics of water transfers at the July meeting. He then turned it over to Kevan Samsam, Supervising Engineer, to update the Council on the work that has been done and how staff expects to address this issue in the coming months. 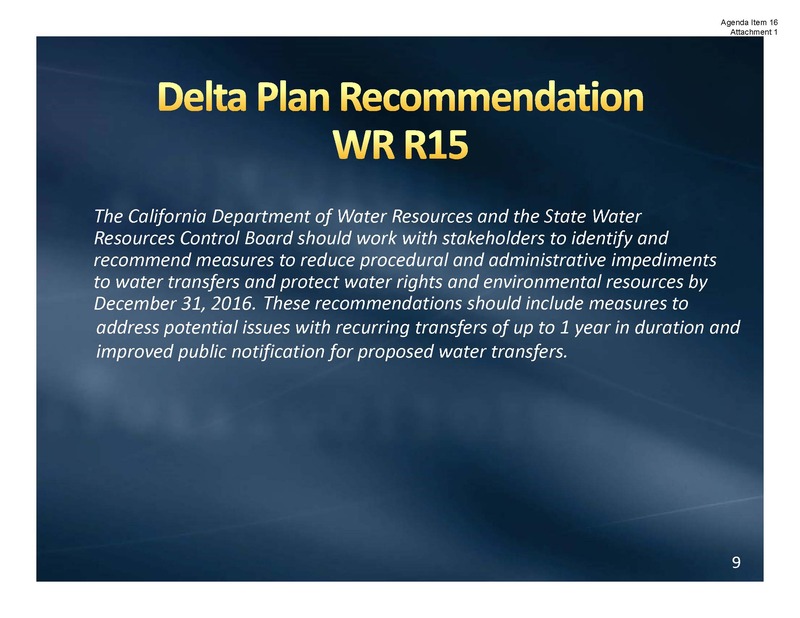 Mr. Samsam said that the purpose of today’s presentation is to review where the Council left the topic of single-year transfers back in 2012-13 when the Delta Plan was adopted in preparation for bringing in experts from DWR and the State Water Board to provide new information. His noted that he would be focusing primarily on north-to-south transfers which use State Water Project or Central Valley Project facilities to move water from the Delta watershed to the San Joaquin Valley. “I should note that water transfers are very common, and this is just a subset of that,” he said. While transfers occur all over California, the most abundant transfers are intra-basin, he said. 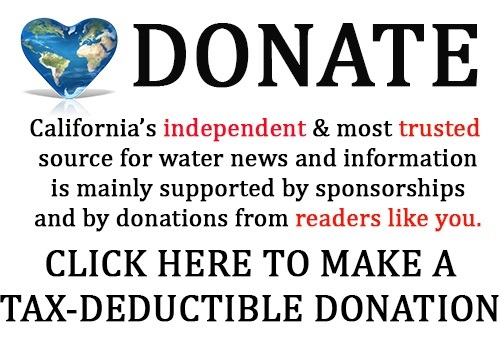 “There is a lot of water that is transferred among farmers and water agencies in Southern California, and there is a tremendous amount of water that’s transferred among the parties in Northern California as well,” he said. 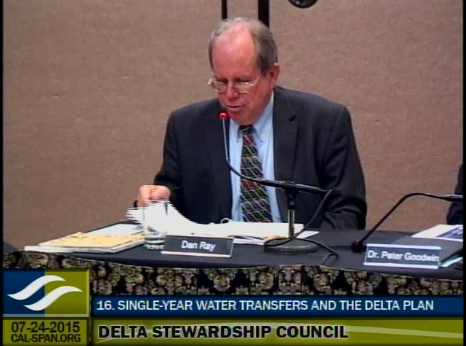 Mr. Samsam noted that as a result of the biological opinions, both the SWP and the CVP are limited to transferring water only in a July through September window when the impacts to Delta smelt are lessened. 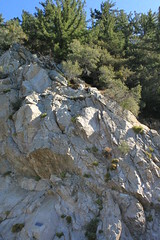 Mr. Samsam noted that single-year transfers that petition the State Board for a temporary change are exempt from CEQA, but since water transfers involving pre-14 water rights do not petition the state board, they are not exempt from CEQA and they actually are still required to perform a CEQA analysis. 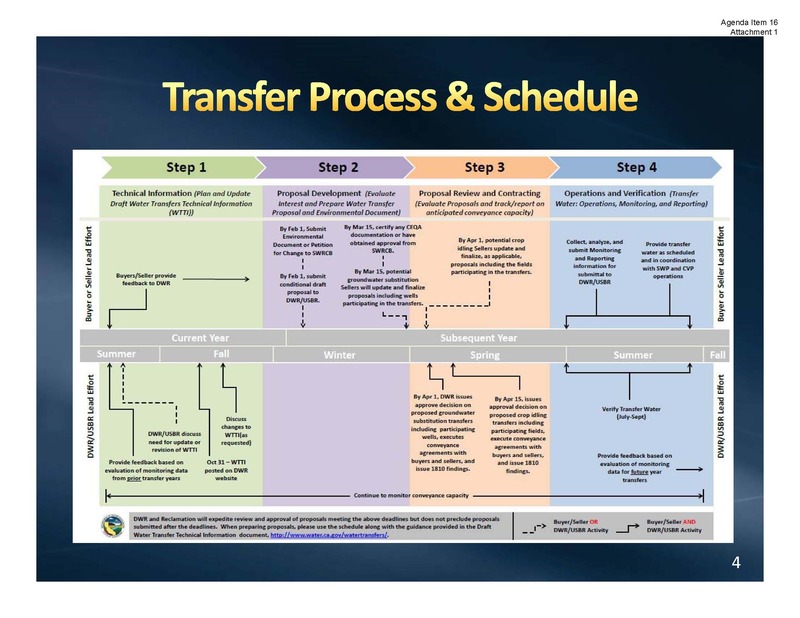 He then discussed the approval process that the three agencies go through in approving transfers. “With respect to the State Board, the State Board must find that the proposed transfer will not injure any legal user of water and will not unreasonably affect fish and wildlife for other instream users,” he said. 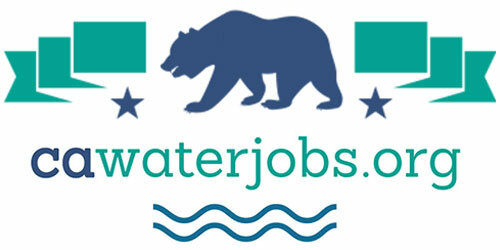 “Both DWR and the Bureau also make sure that the respective CEQA or NEPA documentation is completed,” he added. Mr. Samsam noted that Governor Brown on May 20, 2013 and also again on April 25, 2014 issued an executive order directing DWR and the State Board to expedite the review and processing of water transfers. Click here for the staff report for this item. Click here to watch the webcast. This is Agenda Item 16, July 24th meeting. Bill Croyle with the Department of Water Resources and Tom Howard with the State Water Resources Control Board discuss the water transfer process and the recent efforts to streamline the process.